I admit there are really times I want to fix meals quickly and use short cuts even if I like doing things from scratch. That is why I like Robin Miller and Sandra Lee shows on the Food Network Channel. Another thing that I like too is pasta meals. Aside from stir fry dishes, pasta meals always fall in the category of quick prep meals for me. I would like to share an easy pasta recipe. This is a tuna based dish so this is really good for Lent Season. Cook pasta as directed ( I just use half or 3/4 of the box for this recipe ). Heat the sauce while the pasta is cooking. Drain pasta then add the sauce, leave 1/4 cup as topping if you like. Mix 1 can of tuna to the pasta and sauce mixture( you can choose to drain the oil if you want ). 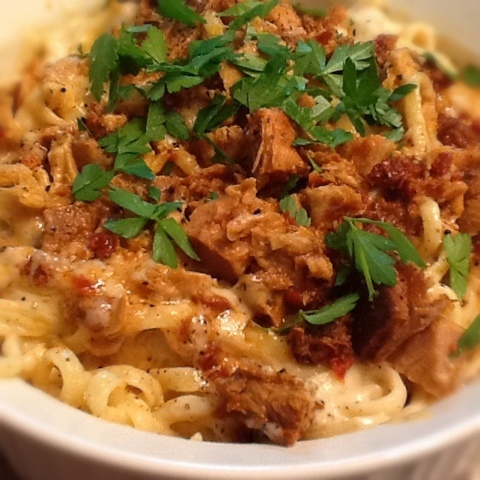 Transfer in serving dish, place the remaining sauce on top the your pasta then add the 1 can of tuna and pepper. Garnish with parsley. This is really good with garlic bread, but we like our pasta with Texas Garlic toast with three cheeses.